Framagraphic is pleased to present the work of Vancouver-based artist Barbara Parkin from August 20 – September 10th. Parkin is an established painter, who has been active with the Federation of Canadian Artists for many years. 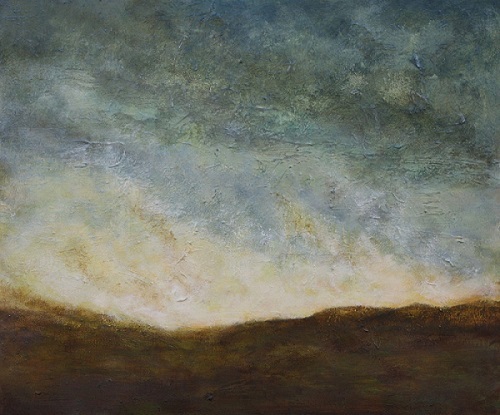 Her paintings depict, but also develop out of, a strong relationship with nature. Earthy hues and tones are built up, likes the soil, through layers of paint on each of her canvases. The paintings themselves depict trees and flowers just as often as they depict less recognizable subjects- puddles of water, or reflections of light. Parkin’s brushwork is loose and active, well suited to represent the loose soil and constantly shivering leaves and pedals she paints. It’s as though the wind continues to pass through them, in between the bark of the trees. In 1990 Parkin finished a Fine Arts degree in Creative Writing from the University of British Columbia. Throughout the 90s, she wrote short stories, many of which were published in Canadian literary magazines such as Capilano Review, Descant, Grain, Queen’s Quarterly, Canadian Fiction Magazine and others. A collection of her stories was published as a book by Nightwood Editions (Harbour Publishing) in 1996. In 2002, Parkin’s artistic focus turned to painting and through the Federation of Canadian Artists she has worked with a number of lower mainland artists practicing in acrylics. Both Parkin’s writing and visual work have considered trees as principle subject matter.